Your perfect wedding starts with your perfect ceremony℠. It's traditional or modern, spiritual or secular, short & sweet, or a reflection of your cultures. Or mix and match! You can have exactly what you want, and it will always be memorable, meaningful and respectful of your values. Whether you choose an intimate elopement in New York City's Central Park, a candle-lit house of worship filled with family and friends, a grand wedding at your reception venue with hundreds of guests, or a private ceremony at your home, let me share in your hopes and dreams and make your day the best it can be. If you're having an intimate elopement, the ceremony is everything. If you're having a grand affair, the ceremony is the reason for the party. So take a moment to imagine your ceremony. I believe your wedding ceremony should match your wedding day vision. Few couples have considered their wedding ceremony until they hire an officiant, so there's no need to stress. As your officiant, I will create a ceremony that reflects your relationship, as you define it. I am passionate that each Wedding Ceremony is as distinctive as each couple. The only element that is legally required in your New York wedding ceremony is that you actually say "I do", or any other verbal form of "yes", as consent to enter into your marriage. Everything else that happens is up to you. Therefore, should you choose, I welcome your participation in preparing your ceremony. Whether you write your own vows or select from my diverse library of spiritual and civil ceremonies, I will compose all those feelings that are often difficult to express in words into a pronouncement of love that will be spoken on your wedding day. Many couples don't know all of the options they have in planning a wedding ceremony. You can choose to have a religious, an interfaith, a spiritual, but secular, or a civil ceremony. You can choose to include traditional cultural rituals, modern unity rituals, or even make up your own. Maybe you want to include readings or have a role in the ceremony to include close friends or family members. You might want to write your own vows. You might even be asking, "Why would I want to do all that?" As your wedding officiant, I will answer all of your questions and guide you through your choices. While we discover what makes your perfect wedding ceremony, remember that there is no right or wrong. Call or email me to find out if I'm available on your wedding day. We can plan to meet in person, via skype or on the phone. Then, tell me your love story, and I will create and perform a marriage ceremony that will be the heart of your wedding day. 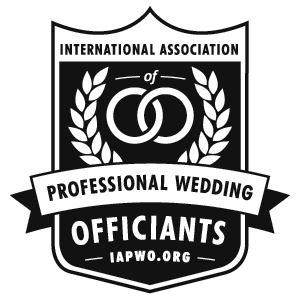 Be sure to read my reviews to see what other couples say about my officiant services, and check out my answers to questions I'm asked all the time. 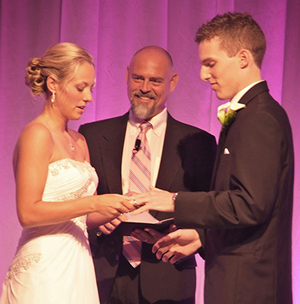 "Your Perfect Wedding Starts With Your Perfect Ceremony"
is a service mark of Our Wedding Officiant NYC. All rights reserved.